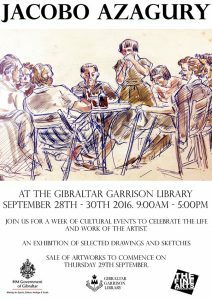 Come down to the Gibraltar Garrison Library as from the 28th of September for our exhibition of Jacobo Azagury drawings and sketches (9:00am – 5:00pm). Wednesday the 28th of September also sees a day of talks delivered to Gibraltar art students by local and international artists (please call the Library on +200 77418 if this is something you may be interested in). On Thursday the 29th of September the Fine Arts Association will also host their weekly Life Drawing session at the Garrison Library as from 7:00pm. 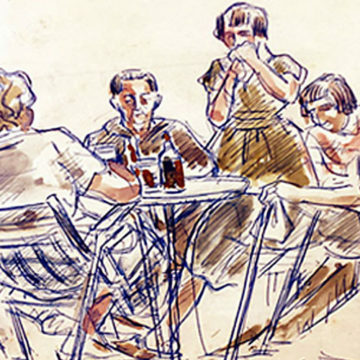 Sale of the Azagury sketches will commence on Thursday the 29th of September so please do not miss out on this wonderful opportunity to view a rare gem of a collection, from a celebrated Gibraltarian artist.